BLOWSIGHT are so eager about rock’n’roll that less than a year after “Dystopia Lane”, here they are with “5 new evil babies”. Why evil? Not a clue. But you know that old saying “if it makes you feel so good, it ought to be bad”? Or maybe it’s because this is their heaviest and fastest work so far. In the beginning of “Magic Eight Ball” you’re taken into a 49-second epic journey before the strings and skins explode in your ears. And towards the end, the harsh/growling vocals we’ve had a glimpse of in songs like “Thought Of Bride” or “Terrorville” are a bit more explored now. In fact, they have quite a presence throughout the whole EP. “The Girl And The Rifle” has lovely synth arrangements and that kind of contagious gang vocals which makes you want to scream along. The heavy main riff in “The Sun Behind The Rain” sticks to your brain, but the more melodic pre-chorus and chorus are just as catchy. Also love the guitar solo on this one. And speaking of guitar solos, the one in “As Wicked As They Come“ is backed up by such a fast drumming that any punk rock band would be jealous of. This is a song which is impossible listening to without moving your body along its beat, so I think it will be a great choice for live shows. Last but not least, I don’t know what to say about “Live Die Surrender” without repeating myself – because almost all the details I’ve underlined before are gathered here. 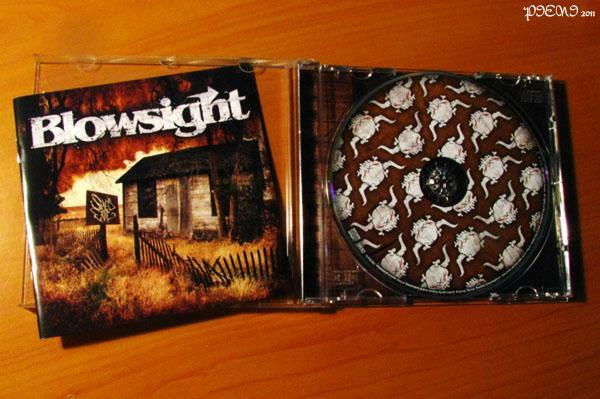 BLOWSIGHT always add a few ingredients to their formula, making the songs sounding “theirs” but without the “I’ve-heard-this-before” feeling. I don’t know about you, but this is exactly what I think a good band should do – evolve. So if you like your rock spiked with metal and full of quality, go check these Swedes out. Get blow-minded… er… blowsighted!